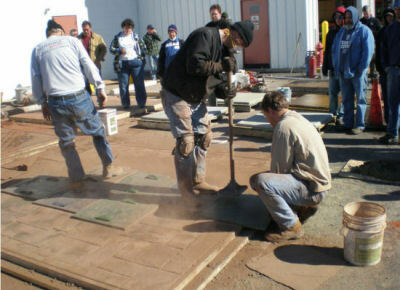 Concrete doesn’t have to be gray, dull or flat anymore. 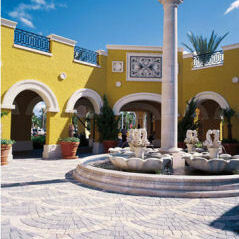 Concrete always has been known for its strength, durability and value. Now these attributes are enhanced to beautiful effect with an ever-broadening array of concrete textures, colors and finishes. 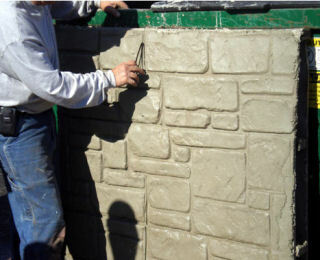 Decorative concrete works well for new construction or resurfacing existing surfaces, for interior or outdoor projects, and for horizontal or vertical applications. Choose from a wealth of colors, patterns, textures and ideas—for patios—walks and driveways—swimming pool decks—restaurants, showrooms and exhibit halls—dramatic corridors—kitchen floors and countertops—and hundreds of other applications. Over 700 liquid colors from leading brands. Concrete stains—transparent and opaque, acid or water-based. Shake-on color hardeners, releases and antiquing agents. Dozens of different stamp patterns for sale or rent, including those shown in our on-line catalog. Stampable and sprayable overlays for horizontal and vertical applications. Stencils with adhesive or non-adhesive backing. Concrete countertop materials and forms. Floor preparation equipment for grinding and polishing concrete floors, including those shown in our line card. Knowledgeable sales personnel who are in the field and work with the products we represent. Numerous samples of stamped, stenciled, stained or colored combinations are on display in Toledo and Akron and Monroe, MI, including many of those shown in our on-line catalog. Suggestions on colors, patterns, and applications, plus help with often-asked questions. Uniform color and consistency from in-house blending and dispensing equipment. We can match colors from all manufacturers. 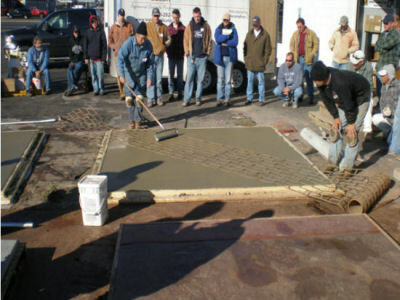 Frequent decorative concrete demonstrations for contractors and do-it-yourselfers. Referrals to trusted installation contractors. 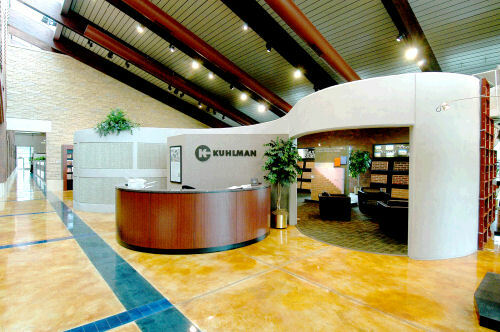 Contractors and do-it-yourselfers look to Kuhlman for their decorative concrete needs because of the Company’s knowledgeable people, years of experience, and extensive inventory of products and accessories from leading manufacturers. For assistance, contact Kuhlman Direct at 419/897-6000 or 1-800/669-3309, or phone a Kuhlman branch. Monroe: 15370 S. Dixie Hwy, Monroe, MI. Phone 734/241-8692. specify Kuhlman for value, quality and service.